With its new joints Fortebraccio 05 guarantees a total light positioning freedom. The lamp�s distinctive handle conveys a highly charismatic, formal look, and provides an intelligent solution to the problem of directing light emission. 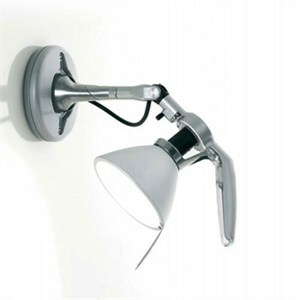 Moulded in polycarbonate, it includes a switch and is designed in such a way as to be easily held and manoeuvred. Dimensions 14" maximum extension, 6"D diffuser. Uses 1 X 100W 120V E26 (medium base) A19 incandescent lamp (not included).